I don’t really get the island daytrip thing. Why would you go for a day when, in most cases, you can stay for a few, explore every corner, get to know some of the people who live there, and not worry about catching the last ferry home? But I now realise that I am becoming a bit of an offshore obsessive. It all started with La Gomera off Tenerife, way back in my twenties, when I got a last minute cheap flight to the mainland, and followed a few hippies heading straight from the airport to the port to catch the first crossing of the day to this unheard of place which at that time was way off all traditional tourist radars. I have been there three times since then, as well as La Graciosa off Lanzarote, Formentera off Ibiza, Privc off Croatia, and not forgetting my rapidly growing love affair with Ireland’s own fine collection, of course. The latest to steal my soul is the Ile de Batz, just fifteen minutes off Roscoff in Brittany. I don’t think it’s a case of feeding some sort of Crusoe craving, as deserted tropical islands don’t really do it for me. I am not even great with small ferry crossings, but as soon as I can see new shorelines and micro landscapes approach, my wanderlust kicks some strength into my otherwise wobbly sea legs. I spotted the Ile de Batz on a walking tour of Brittany’s pink granite coastline last year , just one of the many granite rocky outcrops which pepper the Breton waters. 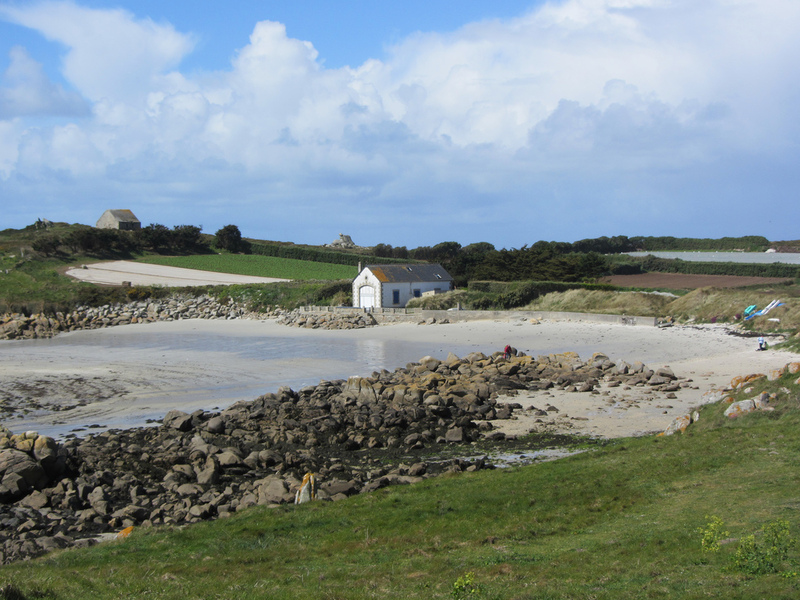 Island daytrips are a feature of this coast, but as we had accommodation pre-booked along the mainland we stuck to our walking itinerary that time round. Ile de Batz grabbed my attention, however, because despite being pretty well populated (nearly 600 permanent residents), car-free to visitors, plenty of ferry connections, a shop, bike hire, accommodation and even a campsite, it had hidden its Breton beauty under a bushel, tucked well away from those who are just passing through. As people whizzed off the Roscoff ferry in search of autoroutes or cycling trails, we walked into the sleepy town centre, just ten minutes from the port, where we grabbed a €7 breakfast of ‘grand crème’, freshly squeezed orange juice, a pannier full of warm croissants and pain de campagne. I find it strangely reassuring on my travels to revisit the same spot, and this sunny waterside Café Ty Pierre was where I had sat this time last year, spotted signs to the island, and been gripped by my island grá. There are ferries to the island every hour, so we supped slowly, took in our new surroundings, and headed out along the pier for the 11am departure. The journey was very calm, crossing out into the bay past the island’s south east peninsula, a Breton flag flying on the cliff top. Well, more high rocks than cliffs, really, with the highest point of the island a mere 33 metres. My heart lifted at the sight of the first white sandy cove of Pors Adelig, then another, Pors Alliou, with just a couple of small fishing boats bobbing in each, before we came round one more small headland into our mooring point, and hub of the island, at Pors Kernoc. We had booked a family room at the island’s Auberge de Jeunesse, or youth hostel, which was just five minutes’ walk from the pier, up a short hill past seashore creperies and couple of bike hire outlets, to a spot which is elevated enough to see paths leading down to both the north east and south east sides of the island. The Ile de Batz is only 3.5 kms long and 1.5 kms wide, with a walk around the whole coastline all of 12 kms. Ah, so we could ‘do it in a day’ , I hear you say, and yes you could, but for the other island infatuates out there, you can do half the island one day, the other half the next, and then just choose a different beach to loll on each day after that, with one for almost every kilometre you cover. 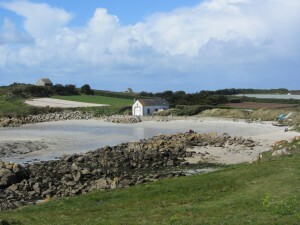 Our first beach, Pors Alliou, was just fifty metres from the hostel, down a quiet path to sands which lead out to grassy island when the tides are low, but which we left in peace as hundreds of seabirds were nesting at the time. But it must make the most perfect fishing spot at other times of year. Pors Allious was close enough to run down in togs and a towel (OK, wetsuits) and be back to put the kettle on, which we did need as the waters here were Celtic cold. There is plenty of drying room at the hostel, so don’t hesitate to pack a wetsuit if you love a quick dip, especially with enticing swim spots at the end of just about every lane. The hostel is basic and not for everyone, but I value the hostel ethos, and even though our family room was just a smaller dorm off the larger communal one, which we had to pass through to go to the loos and (not very efficient) showers, we threw ourselves into the hostelling vibe of it all and enjoyed the company of our fellow travellers. Especially over breakfast, with fresh baguettes, Breton butter, home-made jam and coffee always ready when we got up, all of us pyjama clad in the communal area discussing our plans for the day. A couple of battered sofas were much needed in my view, however, with benches around tables getting a bit tiresome after a day. And with what one co-hosteller described as ‘grains de pluie’ (literally ‘grains of rain’) being regular features in Brittany, you do need a bit of a cosy corner to play cards in or read your book, rather than just heading back to the dorm. There are, however, plenty of self-catering options on the island as well as a couple of charming guest houses. See iledebatz.com for details. Luckily, the sun shone nearly the whole time for us, and with my 9 year old discovering a love of rock climbing, and almost every beach being accessible by gripping and grasping his way along the impressive piles of granite, we were out all day. My husband volunteered to supervise the clambering while my 12 year old son and I opted for the rather more yielding dune and marram grass route up above. This route also shows off the impressive amount of farming on the island, something a lot less evident in island life back home. Fields bearing potatoes, cauliflowers and shallots belong to 25 farms in total, their produce being sold on via a cooperative to mainland supermarkets all over France. This explains why the only traffic you see on the island is that of a few tractors. Otherwise the roads are quiet, allowing us to send the kids into the feral mode they so miss living the urban lives we have thrust upon them. Fishing is also still very much in evidence on the Ile de Batz, with several houses along our walks offering fish and seafood for sale. Within two minutes’ walk from the hostel we were able to buy fresh new potatoes straight from the field and so, on our second night we dined on enormous Pollack steaks with local salad and spuds, all sourced within about three minutes’ walk from the hostel, as we sat in the sun overlooking the bay. Another night was spent drinking our aperitifs and eating savoury galettes and crepes at the Creperie du Port, again on the sunny water’s edge, where fishermen gathered at the end of the day, and kids spent hours jumping over the sea wall onto the soft sands below. And all only ten minutes’ walk back along the shore to our beds. Ah, so perhaps that is why I have an insatiable love of islands. It isn’t some tortured need to be isolated from the world, or to feel like I can walk around it and always know where I will end up. It’s simply sheer laziness. Nothing is far away, natural beauty is everywhere I look, I can swim, trek and cycle, and not feel as if I have to take on a triathlon, and the pace of life reverts to the traditional clocks of farming and fishing. We all tuned into this quickly and happily, watching the daytrip suckers dash for the last boat back, as we sipped our Breton cider ‘au bar’ and pretended we were locals. We may have only been islanders for a few days, but the separation of even just this short stretch of water made us feel as if we had been marooned for a month. 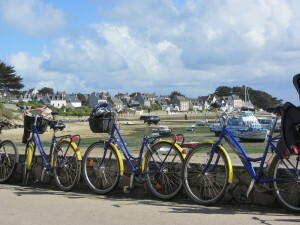 Go there: Take the ferry from Cork in Ireland, or Plymouth in UK to Roscoff with Brittany Ferries. From €185 per person return from Ireland, based on two passengers travelling on foot and sharing a 2-berth en suite cabin. Or £160 return from UK. 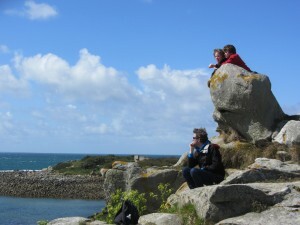 Ferry from Roscoff to Ile de Batz €8 adults, €4 children. Bring cash for the island ferry, as card facilities were not available when we travelled. 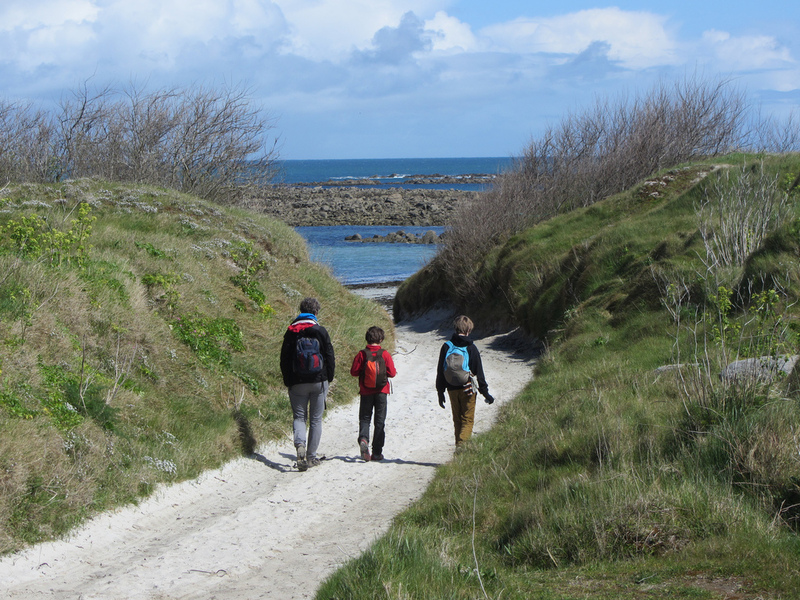 This entry was posted in Articles and tagged ecotourism France, france, green tourism in France, Ile de Batz, islands in France, islands near Roscoff, responsible tourism France, things to do in Roscoff. Bookmark the permalink.